Arena Roberto Paz in Guadalajara. 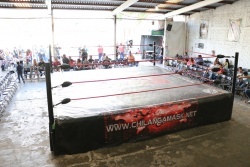 The Arena Roberto Paz, formerly known as Arena Victoria, is a lucha libre arena based in Guadalajara, Jalisco. It's the home arena of NWG. Deputy Director: Roberto Paz Jr..
Gómez Farías 2603 (between Del Parque Avenue and Chamizal Avenue), Col. San Andrés, Guadalajara, Jalisco. This page was last edited on 18 September 2015, at 14:58.